I have been meaning to start posting more beauty for longer than eternity so let's take NY resolutions as an excuse. Given the humongous doses of sugar I consumed during Christmas my skin is more in need for extra hydration and care than ever. I am currently on rotation with these guys and some more not seen in the photo..
Herbivore Botanicals: Pictured here is the Jasmine Body Oil - and oh-what a bliss. I am a sucker for a good jasmine smell and this is so fresh and intoxicating! There is actually a whole story dedicated to herbivore; I just love everything they do. In fact, I have taken Rose Hibiscus Hydrating Face Mist and Orchid Facial Oil to the very end! Also, the Brighten Pineapple + Gemstone Mask is currently my favourite mask in the whole world. NOT SPONSORED people. You can order them online and believe you me, they worth it! Ah.. also, not pictured but worth mentioning as my face and I swear by it for the last 3 years - Kiehls Midnight recovery oil, I love you. Klar is a brand that I have tried very recently and I am currently using their handcream - too good. Also, this and this for hands. Victoria Bekham for Estee Lauder and posh knows what very well she is doing. If you want her glow, now there is a way. Morning Aura illuminating cream does the job. Besides the lush package that definitely makes me fall for it, the cream actually works well as a primer, helping make up sit better on the skin while giving your face a healthy glow. I am also using the bordeaux lip from the same line. In fact, when talking lips and make up in general, I am usually bold with my choices (as goes in clothes as well, duh!). It is either gonna be bare or something natural-ish or bold aka bordeaux or red (I have this since 6 grade). For the first option of bare, I always trust Bobbie Brown or Clarins for that - for which we did a campaign with the brand by the way, in case you missed it . Bold for the the eye lids as well. That's a whole different story I intend to discuss very soon - but the only thing you need to know is that I am following the same suit as per the eyes. Currently hooked on red and orange, but I think I am slowly turning into a unicorn as I am lately loving pink, purple and yellow as well. My 4 ombres palette from Chanel is my go to place for the natural brown eye. And now - eyeliner! In those rare occasions that I am feeling the femme fatale vibes, I always run to this man for his immaculate - straight line, but I recently started liking it for a more everyday use. I just wish I could get that line damn straight. Another NY res. Shiseido is my current buddy. In terms of make-up, I am quite particular with what I use and it all starts and ends with ARMANI. Never have I cheated since the day I tried it (FYI, I use shade 6 for winter and 7 for summertime). Ideal for the no-make up, make up, the Luminous Silk is just beyond. Silky and shiny and so very light. That healthy glow you read in magazines? Thaaaat's it! Don't let that scare you, if in case you have an acne prone skin. You could still go for it and use a concealer with stronger coverage on your spots. I also sometimes use Dior's translucent powder for those days I want my make up to last longer and need to set up. And now my favourite part - nostrils! My smells are usually earthy and fresh or dark, woody and intoxicating. Also, OUD WOOD from Tom Ford.. seductive and intoxicating. Good news is that you can also share with your man. Same goes with Molton Brown's Russian Leather.. tobacco, pine, black tea, leather and basil. Need I say more? But If I had to talk about my two favourites ever and ever, those would be Le Labo Santal 33 and By Kilian's Straight to heaven - and trust me that's what it does exactly, straight to heaven (hearts emoji). Capital B, BEYOND. Never have I been somewhere without someone asking about them. Same vibes for my home preferences. A forever Diptyque afficionado, j'adore Amber and Patchouli smells. Also, currently testing Molton Brown's Fabled Juniper Berries & Lapp Pine and me likey. As a blogger, I am lucky to be sent products out to try quiet often and up to now you could find my ops and mini reviews up on Instagram and stories, but I promise that my favourites will end up here as well. Stay tuned! What about you? Any favourites that I should know about? Herbivore, my darling, where have you been all my life? 96 hours together and I feel I've found my skin-mate! Love at first use. I have been seeing them everywhere, the reviews were all top notch (especially about this one) and only from the packaging and branding I was dying to try them out! Rose Hibiscus Hydrating Face Mist // This has won a front row seat next to my bed. I spray it every morning as soon as I open my eyes. My double espresso comes before the skincare routine (#firstidrinkthecoffeethenidothethings) so it's my first and fresh hello new day, I am ready for you! I also use it after cleaning my face (day and night) and right before I sleep! If I am at home during the day, I might spritz once more in the afternoon just so I give my face another hydr-injection! It has a base of coconut water (j'adore), hibiscus flower (known for its intense moisture boosting), rose (reduces redness and smells heavenly), witch hazel and aloe vera (need I say more?) ! Brighten Pineapple + Gemstone Mask // This is probably my favourite! Promises to illuminate and energise, giving skin a fresh natural glow! The instructions were saying to use the mask nightly for the first three nights and then reduce to 2-3 nights a week. I did. And it does! So, I am not sure if this is a placebo as I was really wanted this to be good, but it damn feels like it! I do see the glow and my skin feels like it's breathing (tat on point, emoji wink). La la lav it! 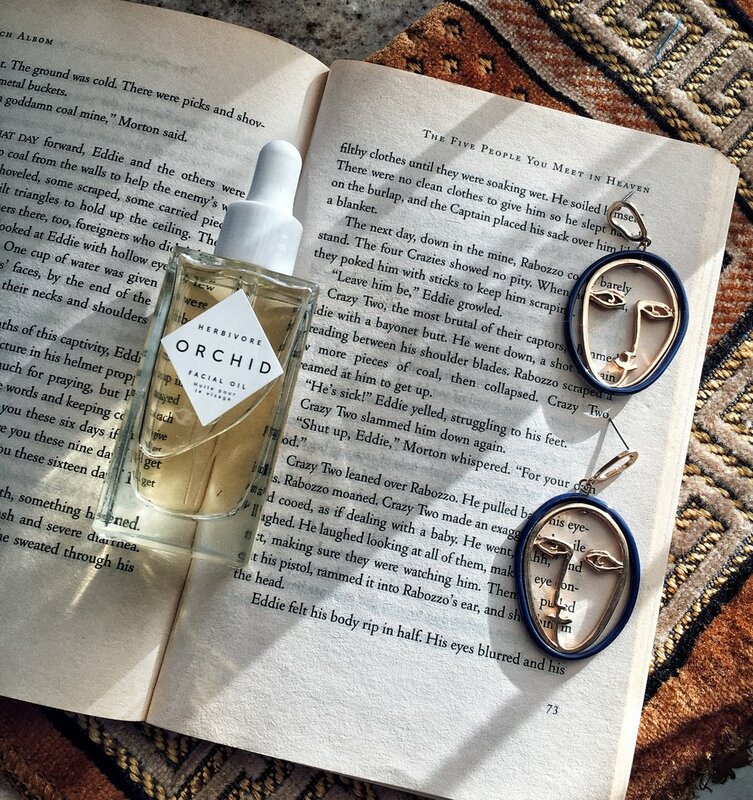 Orchid Facial Oil // Orchid extract, Japanese Camellia flower oil, Jasmine oil (yeeees!). I currently use this day and night instead of moisturiser. Highlight - awesome under make up; in fact it makes you glow. Ah, also, it smells too good! Best for last - I've had some breakouts lately and this along with the mask have made my face a lot better, helping to smoothen and almost vanish them pimples after only these few uses! Jasmine Body Oil // Absorbs quickly, check! Makes the skin smooth, check! Rich but not greasy, check! And the smell.. I cannot get over how wonderful this thing is! Jasmine is one of my favourite scents and this is intoxicating - in the best possible version there is. Overall: Dose approves. Herbivore you got yourself a fan. Disclaimer: There will be more beauty talk from now on. That's a promise! I wanted to add a beauty section on ANDRIASDOSE for longer than eternity; don't ask me why it took me so long, I guess I never had the perfect chance.. until now! Although I don't change my beauty routine very easily, I do try different things from time to time.. however it takes a lot for a new product to make me fall in love and actually add it to my everydayness. My beauty regime is pretty simple and straightforward; a good face wash, toner, an anti-wrinkle eye cream and a day/night moisturiser but lately, I caught myself (and my skin) needing something a tad more intensive. It's Christmas after all - do I need to translate? Partayy! Non-stop gatherings, drinks and food-glorious-food are my next stop so my skin will need that extra hand. Can you relate? Well, I think I might have found us a little treasure! Expensive perfumes come in small bottles! That's what they say right? Bingo! Disclaimer: please take the word expensive metaphorically. I will elaborate. The idea is that the these boosters are super-charged skincare treatments, each one of them designed to offer an instant beauty solution to most common skincare issues we all face everyday. Similar to serums, boosters contain highly concentrated ingredients. There are three boosters for you to choose based on your skincare needs for a more personalised beauty routine. While serums are meant to be used every day / night, these boosters are actually short-term, linked to a specific time your skin might need 'an instant injection'. Unlike serums, boosters are not supposed to be used before moisturiser, but have to be mixed with it. Clarins suggests adding 3-5 droplets to your regular cream. Never to be applied on their own and you can only use them for one day, one week or one month (day and/or evening). Detox : enriched with extracts of Green coffee bean, a natural source of caffeine, known for its detoxifying properties. Clarins states that it restores radiance, purifies and detoxifies the skin aka fight the visual aftermath of too much partying, delicious fast-food indulgent, too many marlboro lights, stress and pollution. Energy : intended to help those with fatigue skin; be it from a lack of sleep (think laptop work till sunrise - oh I can relate), hectic lifestyle in general and also extreme dieting. Plus - jet setters this one is for you - it helps with jet lag and all the dehydration that goes with it. Aims to stimulate and revitalise the skin with the super powerful Ginseng extract (la la lav Ginseng). Repair : containing Mimosa Tenuiflora; a Mayan medical plant well-known for its repairing properties, the repair booster can be used on sunburns (Cyprus, think about it), extreme climates (Alps for ski anyone?) and hard salt or chlorinated water. Aims to minimise redness and works on reducing feelings of skin discomfort. I was eager to try them as soon as they landed on my desk as their was too much talk about them in blogging town. I thought I'd try each one of them for one week before I write this story. I wake up in the morning, I hit the espresso machine, play some jazz and here we go. I wash my face as per normal and apply my toner. Then, I add a dollop of my regular cream onto my palm before adding 5 drops (Clarins suggests 3-5) of my preferred booster, warm up the formula in my hands and then gently pat the mix on my face - never ever rub (cheers for this one Clarins, I didn't know)! I liked all three of them, but the two that really stood out for me were Detox and Energy. I am not really a party pooper nor neglect my good dieting preferences but I do have my bad habits. I work pretty late (insomniac inspiration hits me up often), have a few espressos per day, smoke my cigarettes and indulge in anything chocolat-ish, EVERY DAY (not compromising the later, sorry - I plead guilty). After testing all three of them, I can testify that they do what they say. Boosters did restore dullness as promised and I felt that they somehow sucked toxins out of my pores leaving my skin a lot more refreshed from day one of use. I felt my skin breathing, looking brighter and - dare I say - glowing. It did not feel oily for one single moment and I didn't wake up with some new presents (break-out pimples that is, gritting teeth emoji) - douze points Clarins. Leaving this article for now may or may not have been accidental. Saved for my fellow last minute gifters, as a comfort that there are still awesome gift ideas to be found out there ( this last minute). Plus, let's be honest, you've spent all your salary at Net-A-Porter and you are now broke. It's fine. These cost 30 euros each - not too shabby right? What were you saying? Looking for last minute Xmas presents? Let me know if anyone has tried them already.